JustOn Billing & Invoice Management comprises four main functional areas: billing, invoice generation, accounts receivable and reporting. 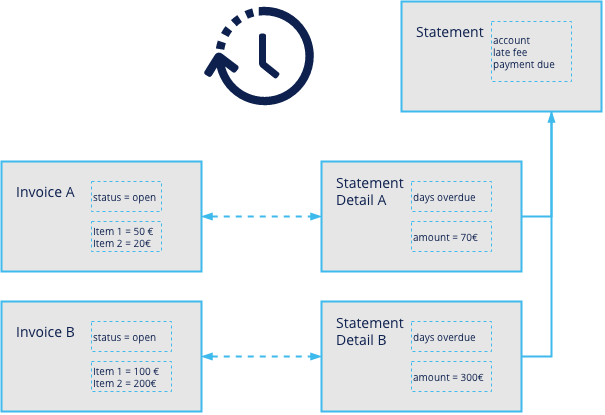 In order to cover these topics, JustOn Billing & Invoice Management complements the standard Salesforce objects account, opportunity and product with a number of new business objects, along with the according UI elements. These additions allow you to easily manage the invoicing data and processes. If you want to bill recurring items, usage data, etc. on a regular basis, we recommend to create subscriptions and, consequently, to produce invoices based on them. If you sell one-time products, however, you do not need subscriptions - you can directly create invoices from arbitrary objects or opportunities. When setting up a subscription, you can leverage all data that is already available in your Salesforce organization. 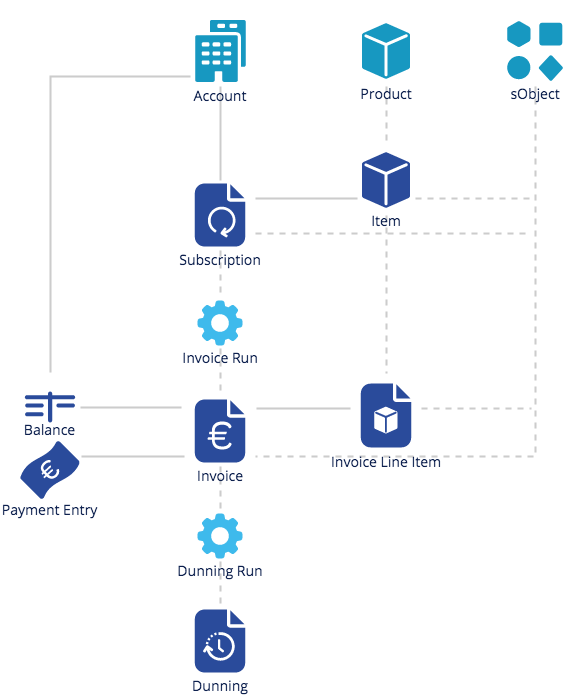 A subscription is the main "trigger" for an account to be considered in an invoice run - that is, each account for which you want invoices being created automatically is to be assigned a subscription. You can create subscriptions manually or have them built automatically. Subscriptions include items. They represent the products to be charged and will figure as invoice line items on the created invoices. Depending on the nature of the product, you can define a specific price model or billing type for an item. Recurring: The item is billed with the given amount in each invoice run. One-Time: The item is billed only once. After the item has been billed for the first time, JustOn sets its status to Inactive so it will not be included in subsequent invoices. Transactional: There is no quantity defined for the item. Instead, the information (quantity or quantity + price) is provided by usage data that match the subscription item. Recurring Prorated: The item is billed with the given amount in each invoice run, with support for the partial calculation of billing units. Must be enabled specifically, see Enabling Partial Billing Units. The actual price of an item can be of two types. Flat: With a flat price, the item's quantity is assumed as 1 and the item's subtotal equals the configured flat price. Default: When specifying a default price, the item's subtotal is determined by the specified default price multiplied by the actual item quantity. In addition, you can set price tiers. These are a means to specify multiple prices for an item, each being valid for a defined quantity range. an identifier, which is used to assign the usage data to a subscription item. JustOn retrieves raw usage data (for example, via data import or a third-party integration) and converts it to transactions. During the invoice run, JustOn matches the transactions against the defined subscription item, evaluates the provided quantity information and calculates the item's subtotal. This data then makes up the according invoice line item. You can create invoices from arbitrary objects or opportunities that are configured accordingly, "bypassing" the subscription. To this end, JustOn allows for configuring virtually any Salesforce object to hold the required invoicing data. This may include orders, contracts, opportunities or custom objects. Using custom filters, you then define which objects and records to include in the invoice run. JustOn's invoice generation is centered around the invoice run, which creates invoices and credits. customer and product data as stored in an opportunity, if set up accordingly. An invoice run is performed at the end of the billing periods as defined by you. Integrating an external tax provider. Invoices are the statements that document your payment requests against your customers. According to the business needs, invoices have different statuses. Draft: New invoices have the status Draft. You can check draft invoices for correctness and edit them as necessary. Open: If you approve of a draft invoice, you Finalize it. This sets the status to Open, making the invoice effective, that is, due for payment (and unalterable). Paid: With incoming payments that make up for the due amounts, open invoices become Paid. Credits, put simply, are invoices with a negative amount - statements about money you have to pay to someone else. Think of a marketplace scenario: You sell products that are delivered by a participating organization. You receive the customer's money, but you have to pay out the fulfiller. Other examples for credits include refunds or overpayments. As invoices do, credits have different statuses according to the business requirements. Draft: Like usual invoices, new credits have the status Draft. Settled: Once the corresponding payments are refunded or you have generated a new invoice that outweighs the credit amount for the account, the credit is set Settled. Creating a credit for an existing invoice (in the status Open or Paid) you want to reverse - this option lets you select the corresponding items and payments to be done. When setting up a subscription, you must specify a standard template for that subscription. This template is then assigned by default to all invoices created from that subscription. As long as an invoice has the status Draft, you can assign another template. In order to support your accounts receivable management, JustOn creates balances to help you track any transactions. In addition, JustOn integrates account statements and dunning processes. for multiple accounts using the Statement Runs functionality. After reviewing them, you can then distribute the generated account statements. The dunning process feature is optional. Dunning run: You create draft dunnings for open invoices or account statements. Finalizing: You close the dunnings and generate the dunning reminder PDF documents. Distribution: You send out the dunning reminders via email. The dunning run refers to the operation that creates dunning notifications. The statements issued with the dunning run are referred to as dunnings. Depending on the progress of the dunning process, they can have different statuses. Draft: New dunnings have the status Draft. You can check draft dunnings for correctness and edit them as necessary. Closed: Finalizing dunnings sets them to Closed, generates the PDF dunning reminders to be sent out, and adds the defined dunning fees to the account balance and the open invoice amount. As a whole, this makes the dunning operation legally effective. the due period and a grace period. Using multiple dunning levels, you can build your individual dunning escalation scenario, which may progress from friendly reminders to firm warning letters. Once set up, you can then start a dunning run using the Statement Runs functionality. JustOn makes use of Salesforce's reporting feature, providing a number of specific business reports based on your org's invoicing-relevant data. You can select and add these reports to your Salesforce org.